With Sunday worship at the heart of its life, Immanuel is a lively, thriving church, open seven days a week and offering a wide range of activities. The last of the series saw Fidelma Meehan talking on “Faith through Charity”. After sorting out the technical glitches with technology she gave us a very passionate presentation on “Save the Children”. Celebrating its centenary this year, this international charity was founded by a very remarkable lady, Eglantine Jebb, who established the very concept of children’s rights at a time when even human rights were unheard of! Working worldwide in 120 countries each year they assist over 22 million children and are noted for their work in the areas of Education, Health Services and Famine Relief. Perhaps lesser-known areas of their work are in Child Poverty and Child Protection. In a moving plea to us to continue the fight for children and their rights both abroad and in the UK, Fidelma gave some very thought-provoking facts…. the births of 1 in 3 children round the world are not even registered, so they have no nationality or status; in the refugee crisis caused by the conflict in the middle east, some 200,000 children have ‘disappeared’, scattered across Europe and are at risk……needless to say the discussion turned to some very sombre thoughts! The children of Adam are limbs of each other, having been created of one essence. When the calamity of time affects one limb, the other limbs cannot remain at rest. Thou art unworthy to be called by the name of a human. This evening saw the second of two presentations by Liz Griffiths (see below for the first one). 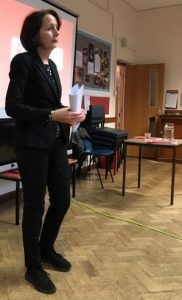 Although still dealing with the theme of ‘change’, this time she offered a two-fold approach to the evening: how to plan for change constructively and what the church might offer to the wider community. Liz offered very constructive advice and tips on how to work towards building consensus when looking to make changes, and reminded us that we also need to try to develop Christian discernment – the ‘mind of Christ’. One interesting thought was that we should always move towards resistance and never back away, but instead positively seek different views: that way we might even learn. The process is perhaps more important that the outcome – a lesson for us all! 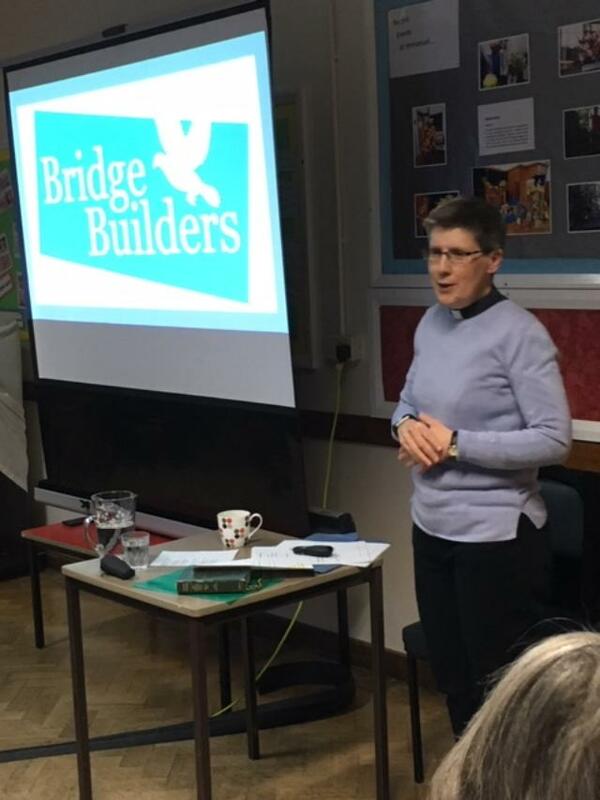 Revd Liz Griffiths who works for “Bridge Builders” led our session this week. Bridge Builders is charity that stems from the Mennonite church and works in the area of “conflict resolution”, seeking ways to transform conflict in many different areas of life. At a time when conflict and change is all around us, even in our own UK political scene, it was a very apposite theme to be considering. Liz led us to consider the various types of change we meet and how we react and cope with it, giving us several practical exercises to help us understand and analyse our own personal stance. 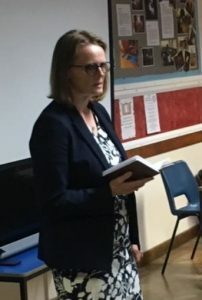 Towards the end of the evening she moved on to take something of a theological view of what change entails by looking at Psalms and that wonderful section of Paul’s epistle: Philippians 2: 5-11. We all came away, if not wiser, then at least more aware. Geoff and Liz’s 40th Wedding Anniversary: a dangerous precedent to post a photo of a couple celebrating their wedding anniversary, but in this case, with Liz as church secretary and Geoff as organist, I think an exception can be made. 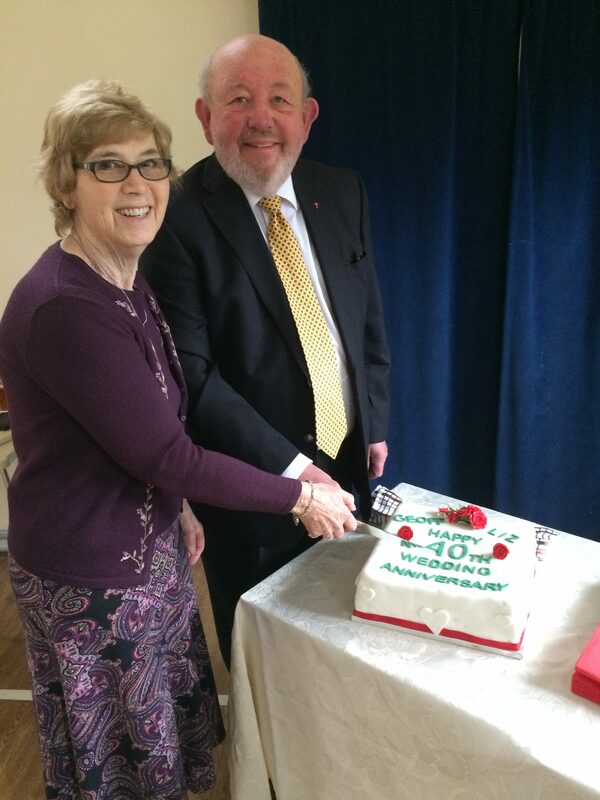 It was a real joy on Sunday morning after the morning service to be able to share both their joy and a slice of delicious cake! Best wishes and congratulations to a couple who do so much for Immanuel! 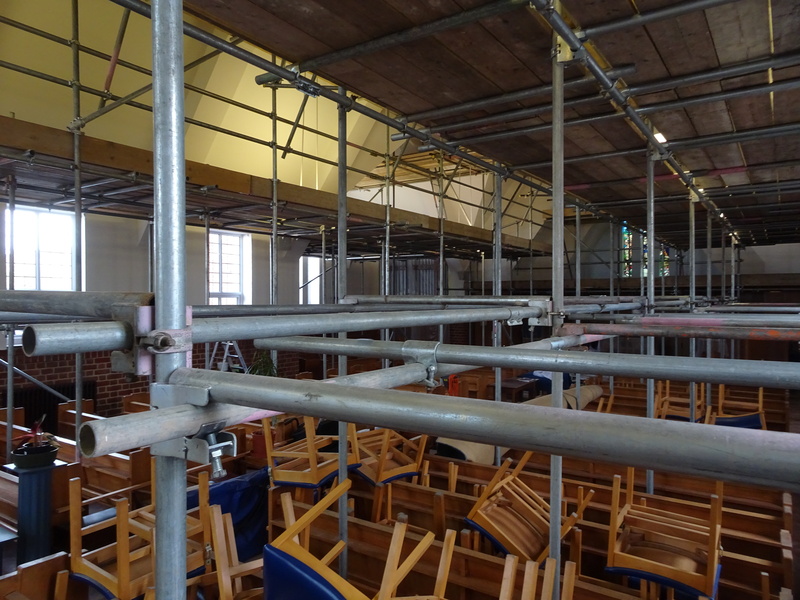 Many of you will be unaware that overnight from 21st to 22nd March our Romanian friends used the church as a very temporary warehouse for all manner of domestic and other goods destined for Namibia. In an act of Christian support to the people of that impoverished country they had assembled a whole container full of items that headed off on Friday 22nd (see photo left). 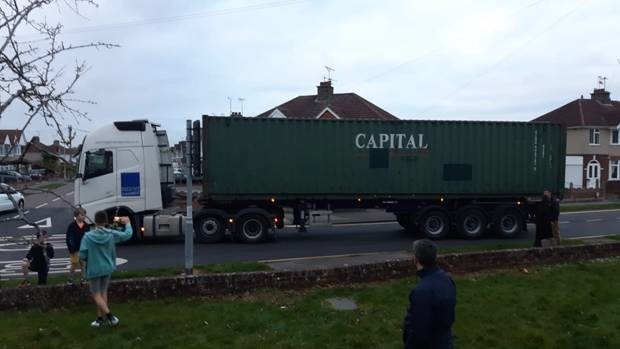 Robert was there to see it go and assures us all that it really was packed full and has a short video to prove it! Its good to know that yet again Immanuel plays a small role in offering humanitarian aid. 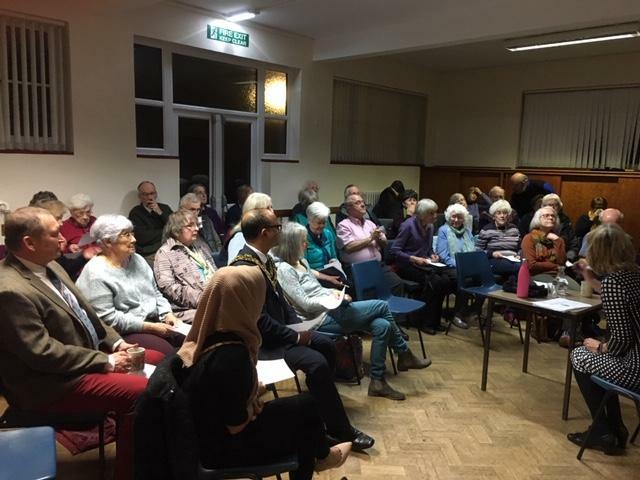 Numbers attending the talk this week were even higher to hear the High Sheriff of Wiltshire, Nicky Alberry, give an impressive presentation on “Faith and the Law”. Initially she covered her own appointment…. from the arcane ‘pricking’ by the sovereign and her induction to the Bailywick of Wilts, and then took us through some of the quaint historical facts surrounding the post – which gave rise to some smiles and laughter. 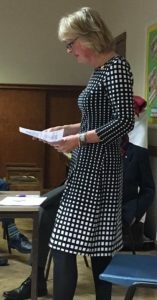 Our High Sheriff then moved on to much more serious matters and the research she has carried out during her year of office into the troubled area of domestic violence. 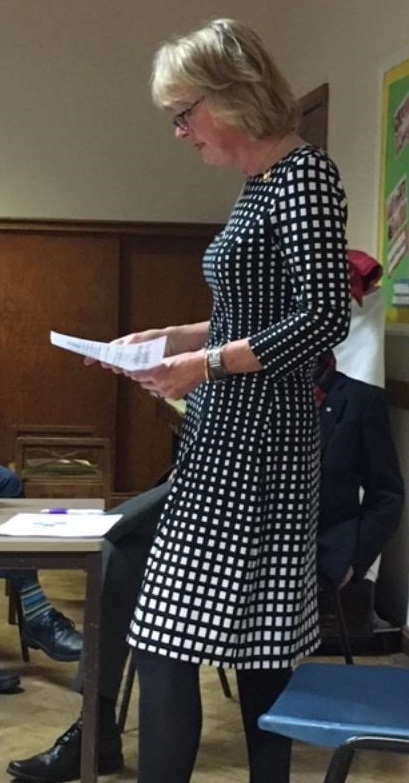 She gave us a very comprehensive overview of the situation as it exists across our county and provided us with some truly shocking stories of the treatment meted out to victims of coercive behaviour – physical violence, mental and emotional as well as financial pressures. It was good to hear of some of the work going on across Wiltshire to support victims of domestic violence (both men and women) and of her own hopes that as she retire that she might be able to leave a legacy of hope. 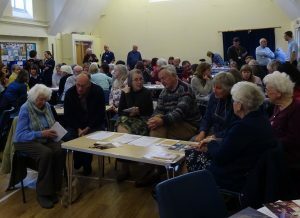 It was clear from the questions and comments from the floor that it was a topic that had ‘hit home’ and may well be an issue that as a Partnership of Churches we need to come back to in future months. It was perhaps a mark of the respect that the High Sheriff has built up in our community that the Mayor of Swindon, Cllr. Junab Ali and his wife felt able to join us for the evening and join in the discussion. Some thirty or so members of the partnership attended an excellent inaugural talk at Immanuel on the evening of 13th March. 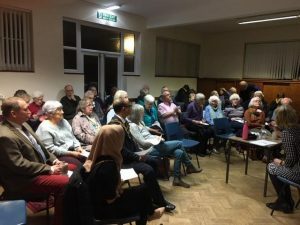 At the first of our annual “Lectures in Lent ” for 2019, the guest speaker was Simeon Mitchell who is the URC’s Secretary for Church and Society based at Tavistock House, London. The subject of his talk was “The Church in the Public Sphere”. 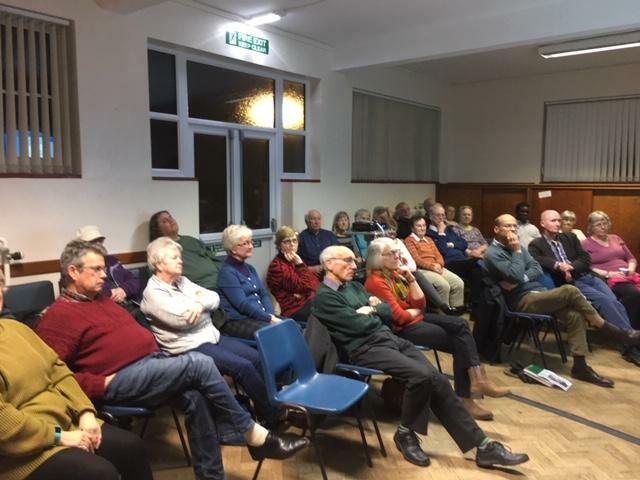 Since he is also a member of the Joint Public Issues Team that links several denominations working for peace and justice, (URC, Methodist, Baptist and Church of Scotland) he was well-placed to tell us of the work being carried out by the church to pressurise governments. His talk concentrated on the need to be a more welcoming society, a society that places the poorest at the centre of our thinking and a society that looks to creating a world that cares for and shares the planet on which we live. The interaction and subsequent level of discussion proved how stimulating and challenging Simeon had been. 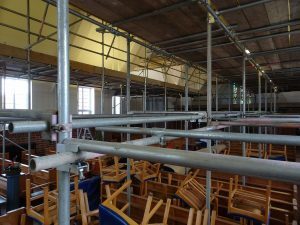 … even if the minister and choir stayed in ‘mufti’ a well-attended morning communion service was held in the church hall and teas and coffees were served in the parlour afterwards. The general reaction seems to have been good: “We could see one another much better, and not just the back of the head in front”! An almost packed church was once again ‘wowed’ by the brilliance of the band on the 56th annual visit to Immanuel (yes, they’ve been coming every year in January since 1963!) Under the baton of their new resident conductor, Glyn Williams, their musicianship just has to be admired. The selection this year was all very modern – John Williams, Duke Ellington, Paul McCartney, Billy Joel…… and feet were tapping from the first crashing chord of “Star Wars” to the final note of their amazing encore number. I mustn’t forget to add that their guests this year were none other than Immanuel’s church choir who gave a wide range of both sacred and secular songs (never before has the church seen so many teddy bears gathered together in a startling version of the Teddy Bears’ Picnic!) 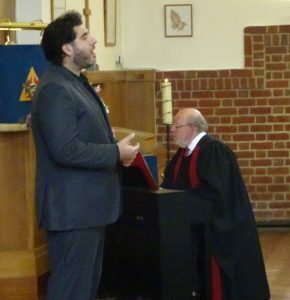 Added to that, Geoff Gleed had kept a little secret to himself as he slid on to the organ stool, and with the band, performed a brilliant rendition of the Saint Saens organ symphony. It all made for a wonderful night of music making: if you weren’t there, you really missed a great night out. 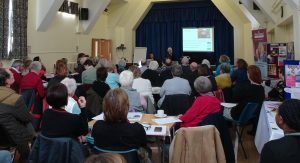 With 75 or more people present, this remarkably well-attended workshop had been organised at the invitation of Immanuel’s Eldership, by the Public Health Dept of our Borough Council, and involved professionals and experts across the sector. With ‘attendees’ coming from churches and other faiths across north Wilts, it gave ample opportunity not only to hear and receive good advice, but also, importantly gave us the opportunity to share. Two speakers in particular stood out: Dr Jennifer Bute a GP from Somerset and herself diagnosed with alzheimers, and then Rev Dr Margaret Goodall; both gave really useful advice on how to support ‘faith’ through the journey into dementia for those diagnosed and for carers. For Immanuel it was the first step on our journey and it is to be hoped that we will be able to develop some of the ideas put forward. A second workshop may be possible later in the year. Right: some of Immanuel’s members consider implications for our church. 20th January: Festival Fifty – What a Birthday! “…to be different is not to be wrong. Ecumenism rejoices in the fact that we can worship in different ways and can affirm and hold to our way, without denying the validity of the way of others”. In a good-humoured address full of anecdotes, he then went on to urge us to look beyond our partnership boundaries and be a force for change in a world that is in desperate need. The evening service at Immanuel marked the Week of Prayer for Christian Unity and in a more reflective act of worship Rev Dr. Susan Durber, Moderator of the Faith and Order Commission of the World Council of Churches, reminded us of the need to pursue justice in God’s broken world. 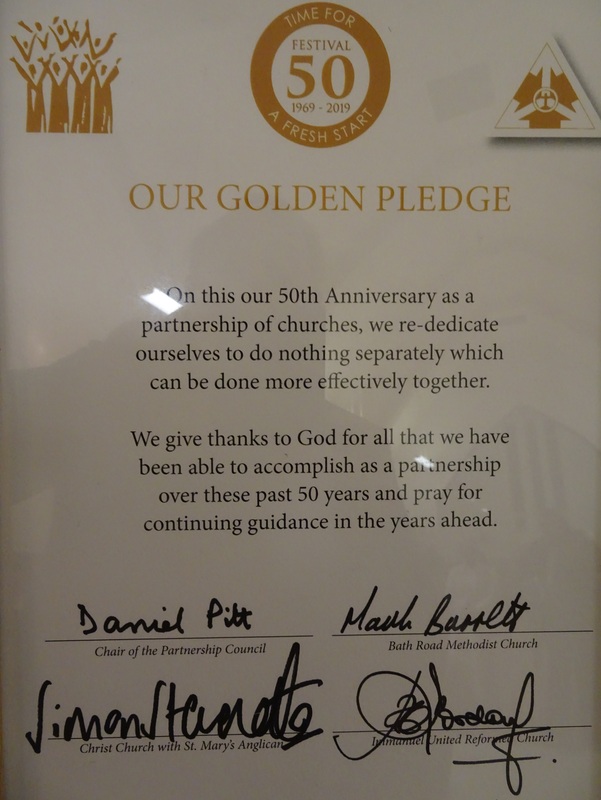 During the service we each made a personal pledge to do what we can in our own small way to achieve this aim. Lord God, we thank you for calling us into the company of those who trust in Christ, and seek to obey his will. May your Spirit guide and strengthen us, in mission and service to your world: for we are strangers no longer, but pilgrims together on the way to your Kingdom. Although the anniversary of the opening of the church is not until September, we wanted to mark the 80 years that have passed since the foundation stones were laid. 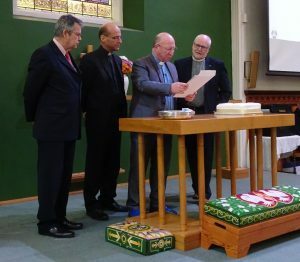 A well attended service had hoped to welcome our Synod Moderator, but sadly she was laid low with back problems and so the minister stepped in to lead the service using her notes. 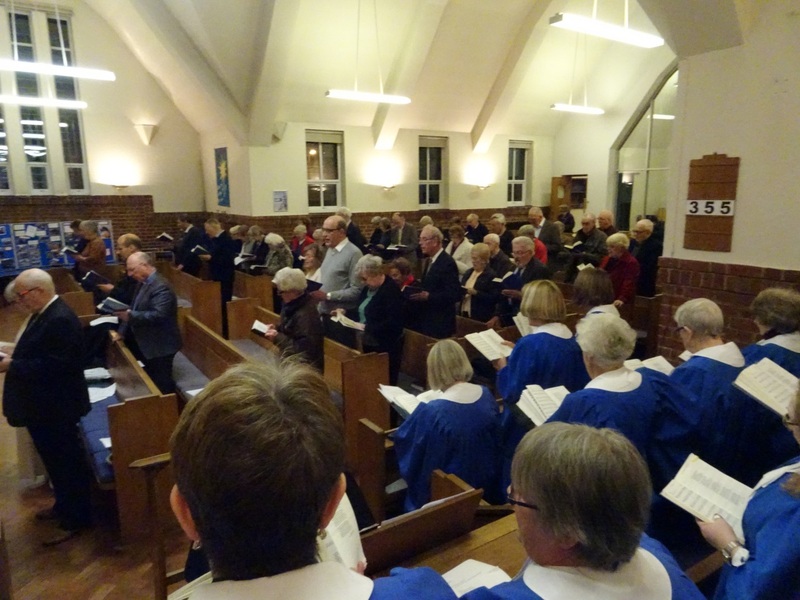 Some rousing hymns and excellent singing by the choir in the introit (“Christ is our Cornerstone”) and the remarkable “Then shall a star arise!” by Mendelssohn as the anthem set the tone for what was a memorable service. A particular highpoint was the very moving solo by our peripatetic choir member Mario (not only a local GP but also a professional opera singer) who performed the well known “I’ll walk with God” from the Student Prince. It all made for a fitting way to celebrate the faith of our forebears as well as look to the future. Revd. Robert H Jordan M.A., B.D. Those coming to the 10.30 service at Immanuel – please bring a single bloom to decorate the cross.